The Oppo Find 5 is one of the handsets we’ve seen recently that tries to change the perception that only affordability and middling quality can come out of China - it is a premium device with a 5-inch 1080p display and all the quad-core internals of a cream of the crop smartphone. And now the Oppo Find 5 release date has been pinpointed for January 29th for China. We still don’t have a specific date for the device’s launch in the United States and Europe, but Oppo has earlier confirmed it will bring the Oppo 5 to Western markets soon after the Chinese launch. In China, the Oppo 5 costs 2,998 yuan, which is the equivalent to $485, and in the States the price will be almost identical. 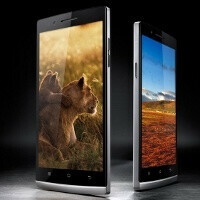 The Oppo Find 5 16GB model is said to retail for $500, while the 32GB version will set you back $570. Thanks, but I will say no! Very good price point for basically the same phone others sell for $200-300 more, it'll drop into the 400s too in the upcoming months. Seems to be a good offer, I think. It looks nice and is rather powerful for its price... But I'd rather pay more for either the Xperia Z or the Galaxy Note 2.